If you have Wi-Fi dead zones in your home or office, one of these powerline kits could solve the problem. Are there places in your home or office where your Wi-Fi signal doesn't reach? You're not alone. Because of Wi-Fi's limited range -- and old-school building construction techniques like thick plaster, brick or masonry walls -- even the best Wi-Fi networks have dead zones. If you have that problem, you have several options. You can start drilling holes in your walls so you can run network cabling. You can try a Wi-Fi range extender (which might help, depending on the strength of your Wi-Fi and the efficiency of the extender). Or you can use a powerline kit, which routes data over your electric cables by piggybacking the data on top of the electrical current's 60-hertz wave and then extracting the data at the other end. "The beauty of powerline networking is that it is inexpensive, has reasonable range and doesn't require loading any software," says Jeff Heynen, research director at Infonetics, a telecommunications research firm. "That makes it the easiest way to liven up a networking dead zone or extend a LAN." Using a powerline kit is indeed about as easy as it gets. All you do is connect one of the adapters to your router via an Ethernet cable, and plug it into a nearby AC outlet. You then plug the other adapter into an outlet near your computer, connect it to your computer via an Ethernet cable and voila! Instant networking. The first generation of powerline adapters could slow down your broadband considerably: They only allowed a single stream of data at once and topped out at a speed of 500Mbps. Current adapters, however, adhere to the HomePlug AV2 standard, which uses the MIMO (multiple-input, multiple-output) technology to move many streams of data at once without getting bogged down. There are a few "gotchas" you should take into consideration, though, when it comes to powerline networking. To begin with, this class of networking equipment struggles to get to one-tenth of its theoretical maximum throughput of 1.2Gbps to 2Gbps, depending on the kit. In fact, the actual peak data flow is a little over 200Mbps of delivered data for some of the powerline kits and a lot less for others. This should be more than enough for distributing a Web connection in a small office; in fact, it is in the same class with all but the newest 802.11ac Wi-Fi routers and access points. It will, however, feel like moving data through digital molasses when you're transferring big files. There's an additional problem associated with powerline connections: The two powerline adapters must be plugged in within the maximum range of between 500 and 600 feet. While that might sound like a lot (particularly in light of Wi-Fi's ability to reach only about one-third as far), we're not talking the distance between two points inside your home or office, but the length of the behind-the-wall electrical cables that will carry the data. As a result, it's a good rule of thumb to double the distance inside the building between the two powerline adapters to account for the behind-the-scenes wiring. In other words, if the two devices will be about 50 feet apart physically, you should count it as about 100 feet apart as far as your cabling is concerned. There are also a couple of things users should be aware of. First, while you can use an extension cord with a powerline adapter, it should have only a single port: a power strip can dissipate the data signal over several outlets. In addition, make sure your electrical connection is grounded -- because MIMO adapters use the ground and will only provide a single stream of data without it. That means using a three-prong outlet; it is possible to use a three-to-two prong converter if you absolutely have to, but make sure you attach the converter's grounding wire to your outlet plate's center screw (which, in older homes, will usually be connected to the ground line). Despite the shortcomings listed above, after trying out four of the latest powerline kits for a month, I came to think of them as the equivalent of networking extension cords -- really handy if you need one. These included: the D-Link PowerLine AV2 2000 Gigabit Starter Kit (model DHP-701AV), the Netgear Powerline 1200 (model PL 1200), the Trendnet Powerline 1200 AV2 Adapter Kit (model TPL-420E2K) and the ZyXel 1200 Mbps Powerline Gigabit Ethernet Network Adapter (model PLA5405). I used them to supply my office with data, connect a printer that's out of the reach of a Wi-Fi access point and add network access to a storage room in order to better track inventory. And while they differ widely in range and throughput, all four can offer Internet access in problematic areas of a home or office. In short, powerline Ethernet is one of those rare win-win situations, where you can get networking where it's needed without breaking the bank or raising a cloud of plaster dust. 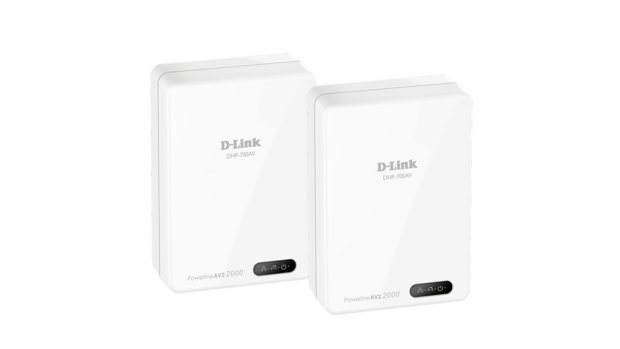 Its adapters may not be the smallest or least expensive powerline devices available, but D-Link's PowerLine AV2 2000 Gigabit Starter Kit uses high-end components and excels at delivering data when the server and client are close to each other. The D-Link kit comes with a pair of powerline units that each measure 1.3 x 2.9 x 3.9 in. They're the largest of the four powerline devices I looked at, but they don't obstruct the AC outlet above the one used by the unit. However, unlike the other three powerline adapters reviewed here, each D-Link adapter is so wide that it can block an outlet to the right or left of it. Like the others, each adapter is designed as a white plastic box with a three-prong grounded electrical plug. A trio of LEDs shows that the unit is powered, has linked with another powerline device and is connected to the host network. On the bottom of the unit, there's a recessed reset switch, an Ethernet port and a button for encrypting the data stream. Inside is Broadcom's AV2 MIMO chipset, which is capable of a maximum data throughput of 2Gbps, 67% faster than the 1.2Gbps Qualcomm QCA7500 chip that the other three systems use. As its name implies, it can handle multiple lanes of data traffic at once. In addition to the two adapters, the kit includes two short Ethernet cables. (You can connect up to 16 powerline adapters.) To connect the D-Link system, I just plugged one adapter in near my router and the other at the closest AC outlet to the client. Each adapter's lights started blinking, and in eight seconds I was connected. Like the others reviewed here, the D-Link units can scramble the data using 128-bit AES encryption. To enable the encryption and pair the units, you press the button on the bottom of each adapter for a few seconds -- you have a couple of minutes to go from one adapter to the other. The D-Link system's ability to dole out data blew the others away -- in fact, it was the only one of the four to break the 200Mbps barrier in testing. However, I found that it works best at close range, where it is least needed. At 50 feet from the server, the D-Link registered a throughput of 204.2Mbps, which dropped off to 130.1Mbps at 250 feet and 30.9 Mbps at 450 feet. The D-Link had a top range of 535 feet -- 35 feet farther than the Netgear system but not as far as the Trendnet kit's 595-foot range. The units are far from the greenest of the four sets; I measured the power consumption for two adapters at 9 watts when on and 2 watts when asleep. It had an estimated annual power bill of $7.60 for the pair of devices if used for 10 hours a day during workdays, assuming a power cost of 12 cents per kilowatt hour (the national average). That's roughly four times what some of the others cost to use. In my office, which is separated from my router by about 400 feet of electrical cabling, the device showed three green lights, indicating a strong connection. It was able to deliver a 45.6Mbps Web connection from my 50Mbps broadband line and delivered smooth HD and 4K videos; it also delivered fine smooth videoconferencing video with well-synched audio. At the time of writing, the D-Link was on sale for $100. It is available only as a kit -- in other words, to add nodes, you'll need to buy them two at a time. With the highest throughput at close range, the D-Link can help link different parts of a network, but its throughput can't match the others at longer distances, where it's really needed. 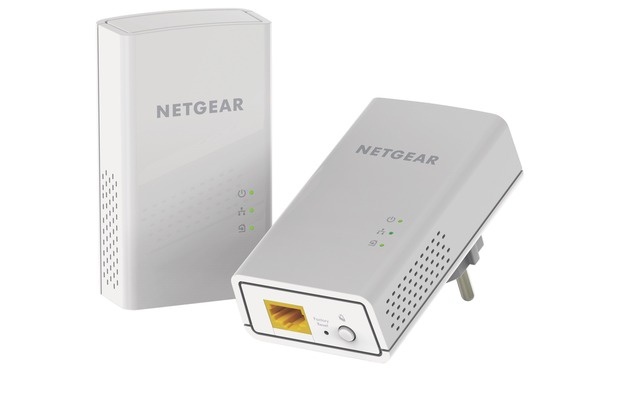 The long, narrow Netgear Powerline 1200 adapters are designed so that they won't block nearby AC outlets, and at $80, the kit is among the least expensive of its peers. At 1.2 x 2.2 x 4.5 in., each Netgear adapter is slightly larger than the tiny ZyXel unit but much smaller than the D-Link. Its white plastic case has three LEDs on the front to show it's powered, has a network connection and has linked with another powerline device. There are vent holes on the side, while underneath you'll find an Ethernet port as well as buttons for resetting the system and for encrypting the data flow. Like the ZyXel and Trendnet systems, the Netgear kit is based on Qualcomm's QCA 7500 chipset; and, like them, it tops out at a theoretical maximum throughput of 1.2Gbps. It can work with several streams at once and link up as many as 16 individual powerline devices. The Netgear kit includes a pair of adapters and Ethernet cables; as with the D-Link, you can't buy individual adapters. After I plugged the two devices into AC outlets, they started communicating in only seven seconds, making this the fastest of the four to get started. If you want to encrypt the data, you just press the Encryption button on the bottom for a few seconds, first on the unit near the server and then on the one near the client. The devices automatically take care of the coding and decoding, as well as key management and distribution. Everything worked well, and the Netgear proved to be a reliable way to move data around. However, its throughput was disappointing. At 50 feet, it moved only 151.2Mbps, 26% less than the D-Link's throughput. At 250 and 450 feet, the Netgear's flow dropped to 110.2Mbps and 20.9Mbps, respectively -- well behind the Trendnet's throughput. It had a top range of only 500 feet, the shortest of the group. On the other hand, the two Netgear adapters consumed only 2.4 watts of electricity when being used and 0.4 watts when in idle mode, making it much less power-hungry than the D-Link. I estimated that it would cost $1.80 a year to use a pair of the devices if they were used for 10 hours every weekday and idle the rest of the time -- the lowest cost of the four kits reviewed here. In several days of testing over about 400 feet of electrical wiring, the Netgear adapter in my office was able to deliver only 24.4Mbps from my 50Mbps Web connection, the lowest throughput of the group. Part of the problem was that its Ethernet and powerline lights constantly blinked red, indicating that the device was nearly out of range. It did okay for basic HD videos, email and Web work, but faltered and halted when playing 4K videos. When I tested the device at about 350 feet, all videos played with no problem. Priced at about $80, the Netgear Powerline 1200 ties the Trendnet system as the cheapest powerline kit, but it can't keep up with the others in terms of range and throughput.